Here in the U.K. we’ve returned to British summer time (thankfully) and the long-awaited lighter evenings are on the horizon. Of course, this also means we are well into Spring, and for me this can never come soon enough! Springtime symbolises rebirth and renewal on many different levels, but for me it seems particularly relevant to our state of health. On a mental level we often undertake new beginnings at this time of year by seeking a new career or relationship, or perhaps by making a determination to walk a more spiritual path in life. 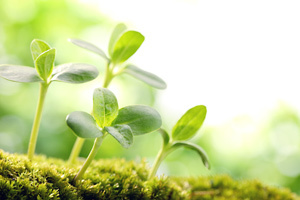 On a physical level, Spring is the traditional season for rejuvenating and cleansing because as the seasons change, so do our bodies requirements. In fact many people visit their acupuncturist four times per year, in accordance with the four seasons in order to balance the seasonal energy changes. The importance and benefits of preparation, in readiness for the growth of all things both spiritual and material has been understood for aeons. These seasonal cycles are very important to our holistic health, and if we harmonise our bodies with them we can benefit tremendously. Essential oils can be used effectively to help renew vitality, restore the balance to your body’s efficiency, and bring us closer to nature. Springtime is the perfect time of year to make this alignment. Surrounding yourself with revitalising aromas is one of the fastest ways of boosting your energy levels, and it is so easy to do since all you need is an aromatherapy burner of some kind. It does not matter what type you use, the results are the same – you will quickly feel energised and in a brighter mood. And living a positive, happy, optimistic life is so much better for your health because holding a positive outlook actually protects you from the stresses of life. Stress has been identified as a primary cause of heart disease, so anything that you can do to reduce stress will benefit your health tremendously. Relaxing essential oils can help directly with this, but energising and revitalising oils can help too because they energise and lift your mood in the same way that taking a walk outside in nature can. Using essential oils around the home is a great alternative if you are unable to get outdoors right now. The aroma of silver fir or pine essential oil conjures up images of green forests with clean fresh air, so it will come as no surprise that these are both excellent oils to use to psychologically energize you and invoke the feeling of spring. A few drops in a vaporiser refreshes the air around you and is highly invigorating when you are suffering from the late winter blues. Grapefruit is another reviving essential oil that is guaranteed to pep you up at any time and it blends easily with many other essential oils to produce a spring-like fragrance. For a thoroughly enlivening experience, add 2 drops of pine or silver fir, 2 drops of grapefruit and 1 drop of may chang essential oils to your vaporiser and you will soon start to feel refreshed and more alive. Substitute the may chang with basil and the fragrance begins to develop a real ‘springtime’ feel which is perfect for this time of year. Don’t be afraid to experiment with the proportions of each essential oil, since this is how you learn to produce a nice balanced blend and it can be great fun. During April 2019 you can find these essential oils (and more) together with a free storage box on offer here. Other energising oils that you can use to awaken your spring-time senses include; bergamot, eucalyptus lemon, juniper berry, lemon, lemongrass, lime, orange, peppermint, rosemary and spearmint. Of course all of these oils can be used in the bath or in a massage if you prefer, but don’t use more than 2 drops of peppermint in a bath since it can irritate the skin. Be sure to use a bath dispersant to distribute the oils evenly and agitate the water properly before stepping in. When we breathe, tiny molecules of vaporised essential oils stimulate odour receptors situated at the base of the nose. From there, nerve messages are sent via the olfactory stalk to the limbic system which controls emotions, motivation, the regulation of hormones, and other vital functions. Via the limbic system, essential oils have an effect on both the hypothalamus and pituitary gland, which are stimulated to produce neurochemicals and hormones that control various systems within the body, such as the endocrine, immune, and nervous system. This is how essential oils can promote the production of hormones such as adrenalin to increase our energy levels, or a neurotransmitter such as serotonin that brings about relaxation. 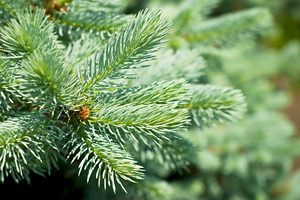 The essential oil of Silver Fir (Abies alba) is extracted from the leaves (needles) and twigs by steam distillation. For centuries, it has been used throughout the European Continent for conditions such as fevers, arthritis, rheumatism, muscular pain and respiratory problems. Like its close relation pine, the aroma of the essential oil is energising and uplifting, which is perfect for this time of year. Vaporize either of these essential oils around the home to recreate the experience of being in a forest at springtime.